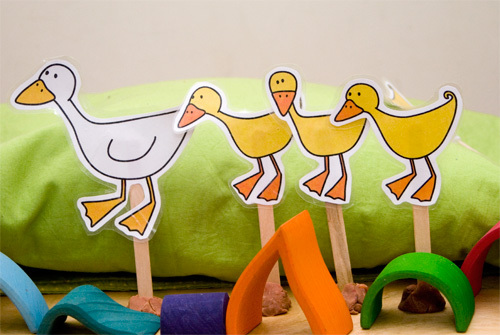 Five Little Ducks Printable Puppets. My kids have been hassling me for a while to make some more stick puppets, like the frog ones we made a while back, and today was the day! We set up our own ‘hill’ and used some play dough to make Mummy Duck stand up all alone, which seemed to fascinate my boy. After a little chat about how I would most definitely be very sad if my beautiful boy (or any of my kids) went over a hill and didn’t come back and how it is important to answer me if I call out “Where are you?” so that I know you are safe…. after all of that we finally got to the singing and puppet show part. 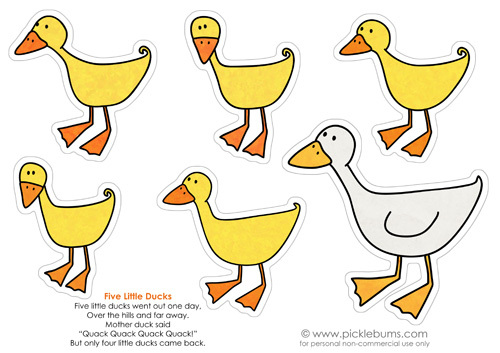 You can download the free five little ducks printable puppets as a pdf here, or just click on the image above. Print, cut out and contact or laminate, add sticks and you are read to go duck crazy at your house! Here’s another duck some that we like. Tape a feather to one of your puppets and you’re good to go! Six Little Ducks the I Once Knew. Fat ones, fair ones, skinny ones too. Wibble wobble, wibble wobble too and fro. What is your favourite ducky song? Oh I like the 6 duck version!! What a lovely activity! Isn’t it amazing that when you start a conversation with a little one (eg a counting song about ducks) that it ends up somewhere completely unexpected (eg. about how you would feel if he went away)?! I love to see how their minds connect between different concepts. Thanks for sharing this! How beautiful! and I have sung 5 little ducks to my boys many times, just using my fingers, this adds quite a bit more fun to the game. Thank you! Gorgeous, my little boy will love this, it’s one of his favourite songs. Although personally I’m more partial to the six little ducks song. 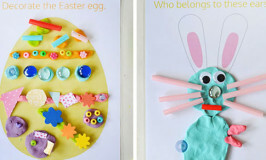 Thanks for putting up fantastic printables like this! Love em. Thanks so much for this! The frog printable has been a huge hit with my little girl (20 months), she runs to grab them if a frog song comes on the CD player so they can “jump, jump, jump”. She adores ducks so I can’t wait to print these out for her. Thanks so much. Had a play date this afternoon so we had 2 four year olds and 2 two year olds. All loved the activity. While the other mummy and I were busy cutting out ducks, the four year olds used excellent maths skills sorting and counting to make sure everyone had the right number of ducks. The 2 year olds enjoyed choosing the colours for their popsticks and all enjoyed the puppet show provided by the four year olds when they were finished. We have been singing 5 little ducks ever since! Thankyou for the puppet printables. I work in the babies room at a childcare centre and my group loved them. Are you planning on doing any other rhymes, as I would love to make up a collection and I’m not as creative. 5 little ducks come waddling back! 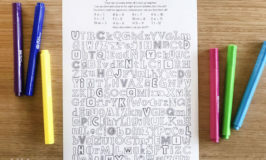 Thank you for the adorable printable. My little boys will love these ducks. thank you very much for the printables!!!!! 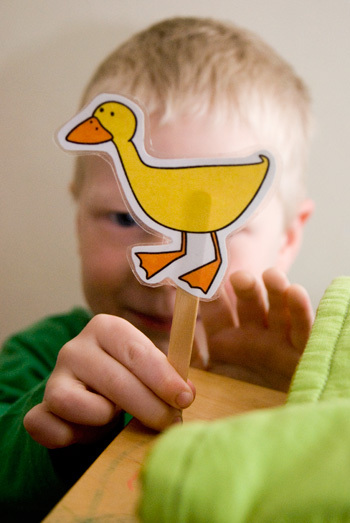 Home » Five Little Ducks Printable Puppets.